I was playing around the other day when I was supposed to be preparing for my Volunteer Class. The supplies were all sort of sitting on the desk waiting to be put away in their proper places when an idea jumped into my head. When I look at it, it is a quick 5 minute card. If only it took me 5 minutes to create. I don’t have a tutorial for this card, but will go through how I created it. To create the mask, I cut the centre from a piece of scrap paper using the small frame from the Project Life Cards & Labels Framelits. I applied 2-Way Glue to the back of it, allowed to dry & adhered it to a piece of 5 1/2″ x 3 3/4″ or 14cm x 10cm Very Vanilla CS. Once dry, 2-Way Glue adheres temporary, so this is perfect for creating masks. I sponged Crumb Cake Ink all over that I wouldn’t have any sponge marks on my card. I then went around the edges a little darker using Crumb Cake. I then spritzed a little water onto my fingers & randomly flicked it over the sponged area. This created the water marks on my card & add a little bit of interest to the background. 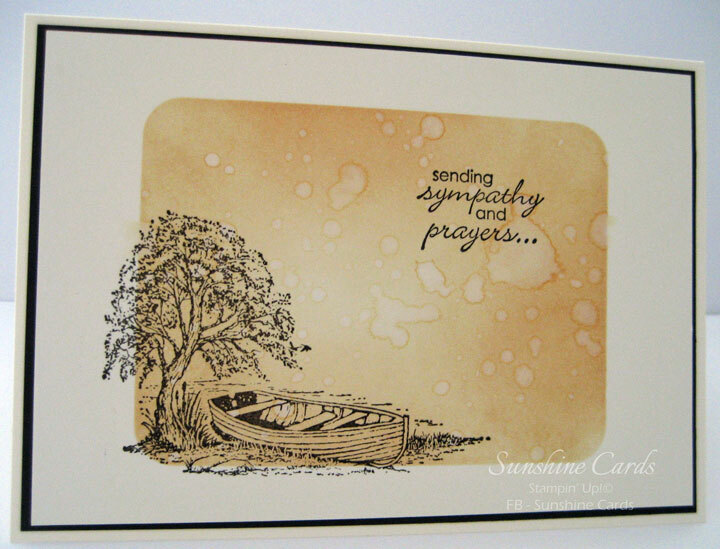 I stamped the image from Moon Lake (Retired) & the sentiment from Petite Pairs in Early Espresso Ink prior to adhering to a piece of Early Espresso Card & finally to the Base Card – Very Vanilla.